909-I-BLK	 Max Label Reels, Solid Color Round Max Label Reel with Strap and Swivel Clip. Sold in quantities of 25. Priced per 25 units. Call for price. 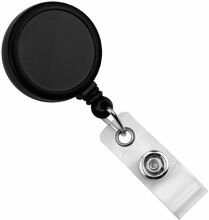 The Brady 909-I-BLK is also known as Brady People ID	909-I-BLK	or 909IBLK	.